Note: If you are using X_TRADER 7.17 to connect to TT Gateways 7.16 or lower to make wholesale trades, click here for a description of wholesale trading in previous releases. X_TRADER® 7.17 and higher includes an updated Wholesale Order window that allows the entry of wholesale orders, which includes Over-the-Counter (OTC) and Cross orders on the various supported exchanges. Allows users to change the quantity of a spread or strategy leg involved in a wholesale trade. Automatically updates to display the exchange-required fields for each order type. Provides the capability to select instruments directly from the Wholesale Order window. Provides immediate feedback on missing fields and invalid values. Supports several exchange-specific wholesale trade types including Cross orders on BVMF and MX, J-Net orders on OSE and SGX One-Sided, and Cross order types. Note: Wholesale trades are only supported on a subset of exchanges, and support for specific wholesale trade order types is dependent on the particular exchange. In addition, before submitting wholesale orders, ensure that wholesale trading is enabled for your username in TT User Setup. For information about how account-based risk is applied to wholesale trades and how it functions with different X_TRADER and TT Gateway versions, refer to the TT User Setup Online Help. You can access the Wholesale Order Window by highlighting a supported contract in the Market Grid. Log onto one of the exchanges that support wholesale trades. Open the Market Explorer and select a product. Open a Market window for the selected product. In the Market window, click the row containing the product. To access the Market Grid context menu, right-click in the specified product row. Highlight Wholesale Orders and click the type of wholesale window you want to open. Optionally, right-click anywhere in the additional fields (Buyer and Seller) and select Confirm Order, Submit Orders on Enter, or Close Window on Submit from the context menu. To close the Wholesale Order window, press the Esc key. As you select the various order types, the Wholesale Order window dynamically updates to include the fields required to submit the order (refer to the following figure). Instrument Explorer: Accessible from the Instrument Explorer icon and available for all order types, the Instrument Explorer allows the user to select/change the current contract. Contract Field: Displays the currently selected contract. Quantity/Price Buttons: Allows the user to set the quantity and price of the submitted order. Select an Order Type available per exchange. You can right-click an order type and select Set as Default. When this setting is checked and enabled, newly launched Wholesale windows will have the previous order type selected, but only if it’s available at the exchange. 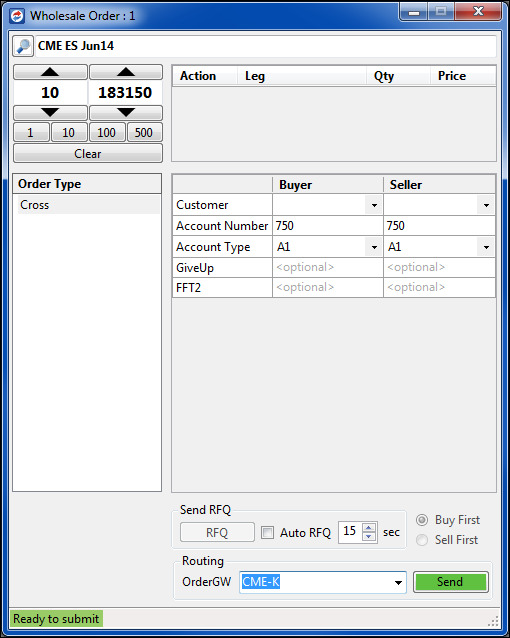 If the default order type is not available, X_TRADER® will select the first order type listed. Confirm Order: Opens the Confirm window when a trade is submitted. Applies to every instances of a newly opened Wholesale Order window. Submit Order on Enter: Enables submitting orders via the keyboard (Enter key). Close Window on Submit: Closes the Wholesale Order window when an order is submitted. Applies to every instance of a newly opened Wholesale Order window. The Wholesale Order window will not submit an order if it does not have a price. Wholesale trades are not available when running X_TRADER in simulation mode. Wholesale orders appear in the Audit Trail window and the Total Traded Quantity column in the Market and Fill windows. Wholesale orders appear in the Order Book window: some for a few seconds until the Exchanges matches the order; others appear longer as they require user interaction. All wholesale orders entered through the X_TRADER 7.17 Wholesale Order window are risk-checked using Account-Based Risk. No MGT-based risk checking is applied.